Speech-language pathologists are in high demand: According to the U.S. Bureau of Labor Statistics, the national employment rate of speech-language pathologists is expected to grow faster than average through the year 2026, with an anticipated 18% increase in job openings. Our program will prepare you to fill this need by becoming a skilled clinician ready to serve those affected by speech-language-hearing disorders. Speech-language pathology majors enroll at LVC as communication sciences & disorders majors. 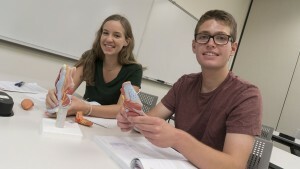 At the end of the third year, qualified students enter the Speech-Language Pathology Program. At the completion of their fourth year, students receive a B.S. in communication sciences & disorders. Pending receipt of Candidacy status from the Council on Academic Accreditation in Audiology and Speech-Language Pathology (CAA) of the American Speech-Language-Hearing Association, students will receive a master’s degree in speech-language pathology at the end of their fifth year. Right now, the number of applications for graduate-level coursework in speech-language pathology far exceeds the available openings in graduate schools. Our program will help you get ahead of the competition. The master’s degree program in Speech-Language Pathology at Lebanon Valley College is seeking candidacy accreditation by the Council on Academic Accreditation in Audiology and Speech-Language Pathology (CAA) of the American Speech-Language-Hearing Association (ASHA). The program is undergoing a candidacy site visit. As part of the site visit, a public meeting will be held on Monday, April 29, 2019, from 5 to 5:45 p.m. at Arnold Sports Center in Classroom Heilman 113. Programs scheduled for candidacy site visits are responsible for soliciting public comment from students and consumers by holding a public meeting during the scheduled site visit. Why an LVC Speech-Language Pathology Degree? We'll educate you to become a competent, ethical speech-language pathologist who provides exceptional care to those with speech-language-hearing disorders. 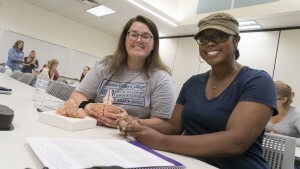 A strong and active LVC alumni network ensures that, with a speech-language pathology degree, you will find extensive support and career connections during and after program completion. This support includes an extensive network of clinical partnerships.